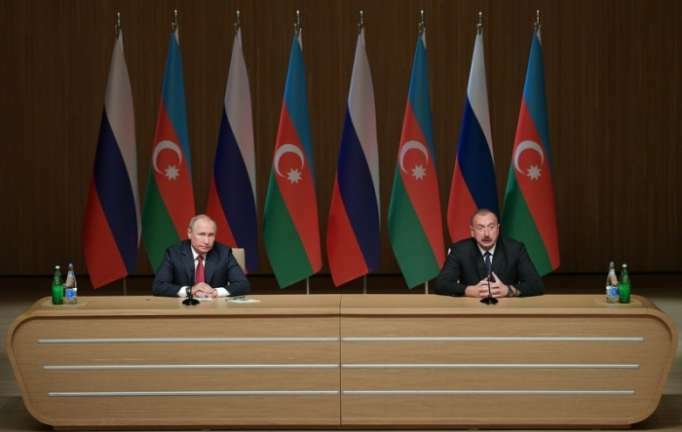 Russia and Azerbaijan are building bilateral relations based on mutual respect and a balance on interests, Russian President Vladimir Putin said, addressing a plenary meeting of the Russian-Azerbaijani Regional Forum in Baku on Thursday. "While speaking about relations between Russia and Azerbaijan, I would like to point out that relations between our countries are definitely based on the principles of good-neighborliness and mutual respect," he said. "We always search for a balance of interests and succeed in finding it," Putin added. The Russian president went on saying that a package of documents paving the way for the further development of ties between Russia and Azerbaijan had been signed at a summit held in the Russian Black Sea resort of Sochi on September 1. Putin noted that about 700 joint ventures were active on the Azerbaijani market, while Russia’s direct investment in the country exceeds $1.5 bln. "In 2017, the deliveries of Azerbaijani agricultural products to Russia significantly grew - almost by 12% - reaching $500 mln. Our partners have been taking particular interest in this field," Putin said, noting that over 30 Azerbaijani companies were taking part in an international food fair being in Moscow. According to the Russian leader, Moscow and Baku continue to implement joint infrastructure projects. "In particular, the North-South International Transport Corridor is being set up - the project involving Iran, Azerbaijan and Russia is aimed at bringing European and Asian markets closer together," Putin said.